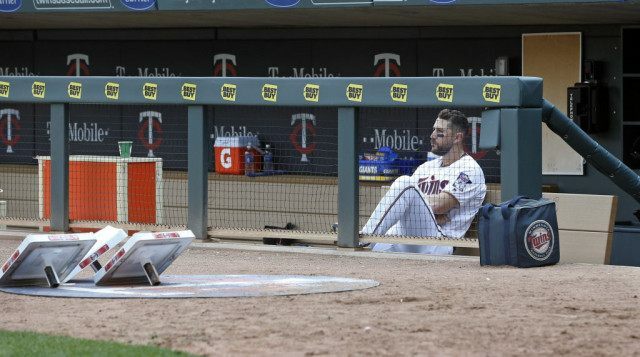 The Twins and Braves are both 0-9, making them the first teams to begin a season with nine straight losses since the 2003 Detroit Tigers. Minnesota already owns the worst start in team history since the Washington Senators moved to the Twin Cities in 1961; Atlanta’s poorest start was 0-10 in 1988. Next up, Tommy Milone pitches for the Twins at Target Field vs. the Angels. Williams Perez starts for the Braves at Miami. Zack Greinke is 0-2 with a 9.90 ERA after his first two starts for Arizona. He went 19-3 with a 1.66 ERA for the Dodgers last year, earning him a rich contract with the Diamondbacks. He tries again for his first win when he pitches at San Diego, which has been shut out five times in its first 10 games. Giants ace Madison Bumgarner has hit six career home runs and two of them have come off three-time Cy Young winner Clayton Kershaw. Bumgarner took him deep last weekend during a game in which both pitchers got a no-decision. They meet up again this time at Dodger Stadium. Mets slugger Yoenis Cespedes is still waiting to break loose. He’s hitting just .233 with one home run and three RBIs after a flashy spring training in which he drove several fancy vehicles to camp. The Mets open a series at Cleveland — he’s a career .306 hitter with two homers, 10 doubles and 15 RBIs in 17 games at Progressive Field. Rockies rookie Trevor Story takes his first swings at Wrigley Field. The shortstop enters with seven home runs, 13 RBIs and a .333 batting average since making his big league debut on opening day. Kyle Hendricks pitches for the 7-1 Cubs.